Exploring race and community in the digital world. More than a decade ago, the scientific community completed what was once deemed an impossible task: researchers from around the world finally decoded the entire sequence of the human genome. With this accomplishment, the “cost of sequencing dropped dramatically – from $3 billion for the first human genome to [just] a few thousand dollars today” (Wojcicki, “Know Your Genome: What We Can All Gain from Personal Genetics”). Although the plummeting numbers on these DNA price tags may not mean much to the general public, the implications of this breakthrough are life-changing. Indeed, the most recent advances in genetic research have just made it possible to answer the question “who are you?” in the most definitive way possible – a person’s past, present, and even future all available at our fingertips. Furthermore, with this data, leaps and bounds can be made to cure disease, eliminate crime, and even pave the way for improvements in the way people live, the likes of which the world has only ever seen in science fiction. But what does this all mean for the concept of identity? Can the genetic information that is extracted and analyzed really define who someone is as a person? Not as a biological being, but as an individual? This very dilemma is one of the most debated issues of the 21st century, and as the world moves ever further into the future, this question will no doubt become more and more prevalent. Thus, it is vitally important to understand how and why the use of genetic information can be both a blessing and a curse, and more importantly, what society should do when confronted with such deeply ethical matters. “With great power comes great responsibility.” Even though Uncle Ben may not have intended for his famous line to become the principle behind genetic research, it definitely reflects many of the ethical concerns regarding this new technology. DNA databases, government genomic records, and public access registries to sensitive genetic information are all growing in number in an effort to crack down on criminals and develop new treatments for disease. On the contrary, what may be just as terrifying as a bloodthirsty serial killer or a growing tumor, is the fact that authorities can abuse the power of “DNA to accumulate information on people’s racial origins, medical history, and [even] psychological profile” (Lawless, “Spread of DNA Databases Sparks Ethical Concerns”). And yet, even with these concerns in mind, more and more government DNA databases are adopted by nations around the world. These databases consist of DNA profiles – information extracted from biological samples like cheek swabs – and are represented by a 20 digit serial code that includes an indicator for gender. In other words, a person’s identity can be, and has already been reduced to mere numbers, like those on a credit card. The only difference is: a credit card number has never at any point so absolutely defined a person’s identity. In 2010, the United Kingdom established the “world’s first national DNA database, which… contained over 5 million” of these DNA “fingerprints,” the majority of which were taken from “those who [were] suspects in investigations,” even if the individuals were later found to be not guilty (“What Is the DNA Database?”). As such, this DNA database essentially contains profiles on thousands upon millions of the innocent population, giving authorities access to sensitive genetic information that can be misused by employers or healthcare insurance companies if given the chance – a chance that may just be within their reach. Whereas large amounts of genetic information, like that stored in DNA databases, can help solve crimes and treat diseases, it is also highly possible that this information can fall into the wrong hands. For instance, imagine a well-qualified, hard-working job applicant who just had a smooth interview and subsequently the shot of landing the position of her dreams. However, when her desired employer calls her the next time, it isn’t to congratulate her on a new offer, but to tell her that they have rejected her based off genetic information implying her risk of breast cancer. Apparently, the company just can’t afford the resources to train an employee who may not be working continuously for a very long time. On the other hand, imagine an older individual who although has been in good shape for the majority of his life, would like a more reliable medical insurance plan as he nears retirement. However, he later finds out that he is being denied coverage not because of his age or because he is presently unhealthy, but because his DNA samples taken from a government database indicate an increased chance of Alzheimer’s disease in his near future. These scenarios may seem improbable and extraordinarily unjust, but with greater advances in genetic research and a stronger emphasis on the storage of DNA “fingerprints,” both screening for the risks of hereditary diseases as well as accessing this information from simple government databases have become far easier than ever before, allowing employers and insurance companies to take full advantage of who they hire or who they insure (“Liberty, Privacy, and DNA Databases”). With this kind of genetic data and the sheer amount of it in one place, what’s stopping the public from discriminating against each other on the basis of genetics? What’s preventing health insurance organizations from withdrawing their services due to unfortunate medical risks? And most of all, what’s prohibiting society from defining who and how someone should be through inferences made through their genetic identity? What’s more, many would even argue that the use of DNA databases and the analysis of the information gathered from the general public is a violation of many essential rights, including the right to privacy, the right to physical and moral integrity, the right not to declare, and the right to health and liberty, just to name a few (Guillén, “Ethical-Legal Problems of DNA Databases in Criminal Investigation”). These concerns have become so great and so pertinent that a law has already been passed in an attempt to address foreseeable issues in the days to come. According to the Genetic Information Nondiscrimination Act of 2008 or GINA, “it is illegal to discriminate against employees or applicants because” of their DNA profile (“Genetic Information Discrimination”). Indeed, GINA not only prevents individual health insurers from using a “person’s genetic information to set eligibility requirements [and]… premium… amounts,” but it also forbids employers from basing their “decisions about hiring, firing, job assignments, or promotions,” on any acquired genetic data. Nevertheless, this doesn’t solve everything. 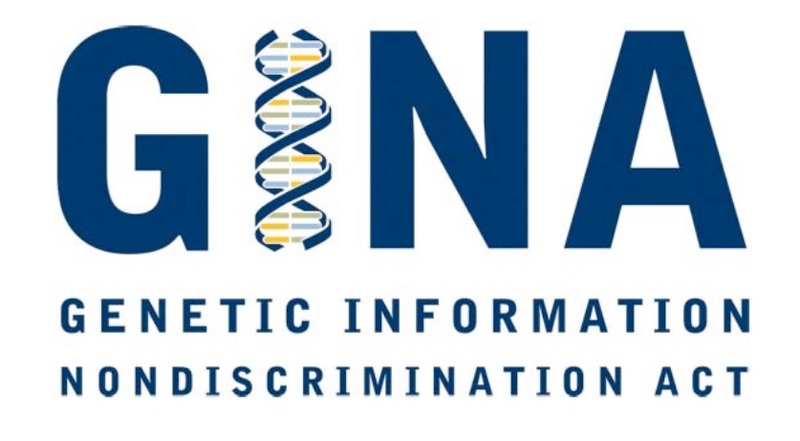 GINA unfortunately cannot provide protection against life, disability, or long-term-care insurers, nor can it prevent discrimination based on current or manifesting genetic conditions (“The Genetic Information Nondiscrimination Act (GINA): A Discussion Guide for Clinicians”). Seeing as how the majority of these issues stem from either the risk of diagnosing a long-term disability or the slow development of a life-altering condition, the extent of GINA’s protective influence is fairly limited. Thus, no matter how many steps are taken to mitigate these controversies, they very much still exist, and will continue to further down the road. In the end, as troubling as any type of privacy breach may sound, the truth of the matter remains the following: the ethical concerns and the practical benefits surrounding the use of genetic information are two sides of a double edged sword. The real question is, which edge is sharper? Although the privacy concerns associated with genetics are no doubt problematic, few can deny the revolutionary benefits that come about from this new technology. The use of DNA today is an important tool to help clear the name of many innocent suspects, suspects who would have been punished irreversibly for crimes they never committed (Lawless, “Spread of DNA Databases Sparks Ethical Concerns”). In fact, since the advent of DNA testing in criminal investigations, “there have been 321 post-conviction DNA exonerations in [just] the United States,” as shown below, and this growing number only scratches the surface of how much forensics practice has aided Interpol internationally” (Massie, “DNA Exonerations Nationwide”). Furthermore, as the number of innocent suspects exonerated through DNA evidence increases, so too does the number of suspects correctly apprehended for the crimes they did commit. Using genetic information to solve criminal investigations is a relatively straightforward process: if a suspect has already been identified, then a simple comparison between his DNA to the samples found at the crime scene can easily determine his culpability. On the other hand, if a suspect has not been identified, then the advantages of a government DNA database become apparent. The genetic information found at the crime scene can be compared to the DNA profiles that are on record, and in that way determine possible suspects to be taken in for further questioning (“Advancing Justice Through DNA Technology: Using DNA to Solve Crimes”). As such, the use of “DNA fingerprinting” in criminal investigations has completely revamped how society approaches crime solving. 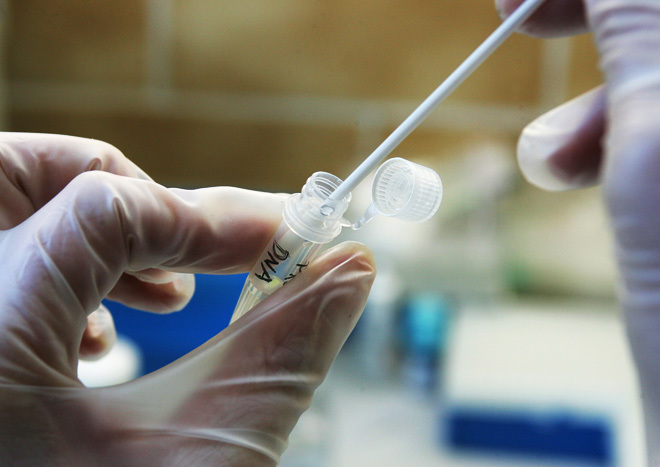 From the case in 1999 in which “New York authorities linked a man through DNA evidence to at least 22 sexual assaults” to the case in 2002 in which DNA evidence allowed for the identification of the individual behind a series of rapes and murders, it is clear that the addition of forensics analysis to the criminal justice system has been a successful venture. As impressive as these accomplishments may be, where genetics research has made the most impact is in today’s medical field. Hundreds upon thousands of people in society have depended on genetic information to screen and diagnose for diseases in their imminent future, and many more are seeking personalized treatment in preparation for whatever conditions may arise. In fact, through the analysis of patient DNA with genetic testing, doctors are able to provide clear medical benefits regardless of the test’s results: if tests are negative, then patients can rest assured knowing they are relatively safe, and if tests are positive, then the necessary preparation for whatever disorder may arise can begin early, allowing for the greatest chance of survival once the time comes. For example, by evaluating how patients react to certain drugs, genetic research can “help them prevent harmful side effects” when it really counts “…and [even] potentially avoid preventable deaths” (Wojcicki, “Know Your Genome: What We Can All Gain from Personal Genetics”). But there’s more. With this type of preparatory information, genetic testing is also able to influence the next generations to come, both by advising parents on lifestyle habits in the future in regards to having children as well as by screening newborns in order to identify possible disorders that may manifest early on in their childhood (“Genetic Testing”). In these ways, the use of genetic information can save countless lives, and improve the conditions of many more as well. Gene therapy, or the modification of an individual’s genes in order to correct genetic abnormalities, has become the most popular topic in today’s medical field. With this strategy, the potential to treat many of the diseases that were once deemed incurable becomes a reality, especially as the applicability of this therapy itself allows for endless possibilities. Gene therapy, as shown below, consists of identifying specific mutations involved in the disease to be treated and creating a suitable replacement for that part of the genome. Then, by using engineered viral or non-viral vectors, this recombinant DNA can be delivered to the body’s cells to isolate, replace, or regulate the particular DNA element that was originally responsible for the patient’s condition. These vectors will repeat the process from cell to cell, slowly repairing the genome through the spread of adjacent areas until a significant portion of the patient’s cells have regained normal function, effectively treating the individual of his or her disease. 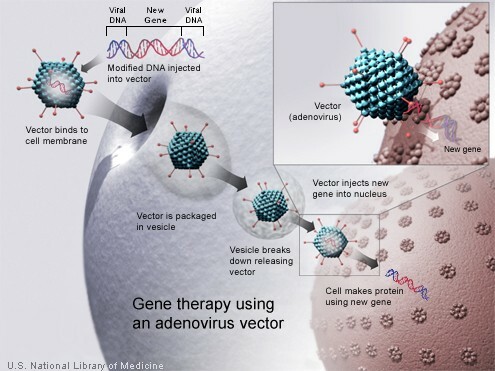 Indeed, gene therapy has already demonstrated promising results treating several types of immunodeficiency diseases, including cancer, and is on its way to treat many more. However, “long-term treatments for anemia, hemophilia, cystic fibrosis, muscular dystrophy…cardiovascular disease, [and] diabetes” still remain elusive today (“Gene Therapy and Cell Therapy Defined”). It is only by dedicating a greater public effort to advancing this technology – and learning more about the human genome – will it be possible to apply this strategy’s benefits to many of these crippling diseases and more. In the end, there are hardly any other alternatives that can offer as much to the world as genetics do, but will the advantages truly outweigh the disadvantages? Does knowing that a cure for diabetes may be waiting to be discovered in the human genome make up for the threats to privacy and personal security? According to some of the world’s most renowned media sources, it seems genetics may just be the more popular choice. But should it be? In order to assess general knowledge and opinion regarding genetics research, a National Health and Nutrition Examination Survey or NHANES was completed in June of 2006. Since this survey consisted of more than 5000 home interviews with randomly selected individuals above the age of 20, it is reasonable to assume that such a large sample size may serve as an adequate representation of the United States population. During the survey, individuals were asked for their consent to the collection and storage of their biological samples to be used for future research, assuming their samples would be used for genetic studies (McQuillan, “Consent for Genetic Research in a General Population: An Update on the National Health and Nutrition Examination Survey Experience”). The participant’s responses as to whether or not they would agree to such an idea were recorded and the rates of consent were then cross examined with sociodemographic factors, such as ethnicity, gender, and age . Furthermore, NHANES was repeated across several rounds, in 1999-2000, 2001-2002, and finally in 2003-2004, each time with the same number of participants, in order to record the changes in public opinion over time (McQuillan, “Consent for Genetic Research in a General Population: An Update on the National Health and Nutrition Examination Survey Experience”). In this way, a comprehensive evaluation of the general attitude towards the use of genetic information in the US can be acquired relative to several different factors, while general support or disapproval regarding genetics can be measured as it progresses through time. 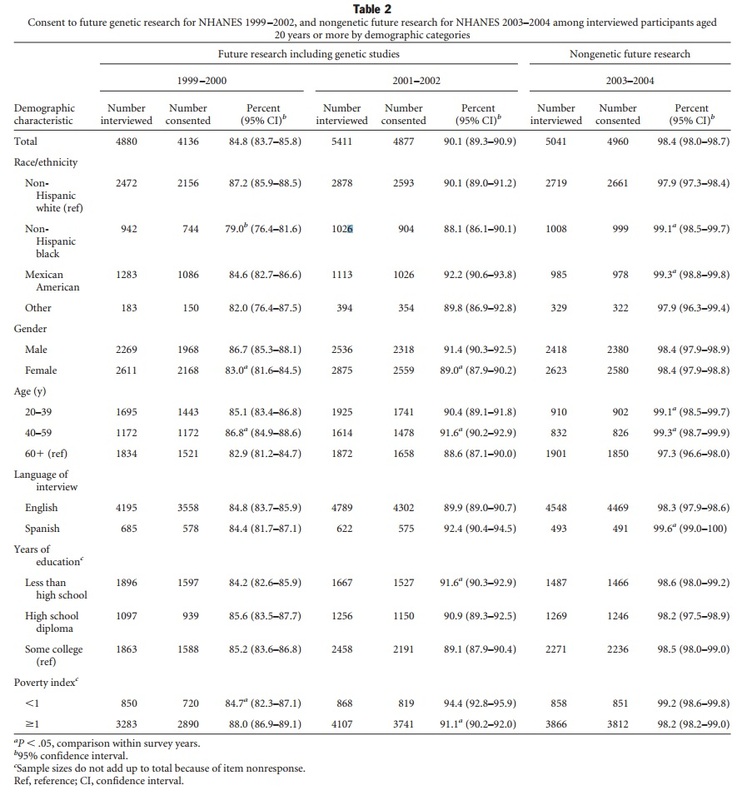 As a result, very interesting patterns were extrapolated from this data, and by examining these trends, a more accurate idea of the nation’s take on the use of genetic information can be acquired (McQuillan, “Consent for Genetic Research in a General Population: An Update on the National Health and Nutrition Examination Survey Experience”). Thus, the information garnered by this survey will ultimately determine the need for more accessible education on this topic, the extent to which more advancements should made towards adopting the use of genetic information, and whether or not there should be greater limitations to genetic research in order to protect individual rights and freedoms. One of the most prominent trends that can be observed from the data collected from NHANES in Table 2 is the significant increase in consent rates across the three different rounds, 1990-2000, 2001-2002, and 2003-2004 (McQuillan, “Consent for Genetic Research in a General Population: An Update on the National Health and Nutrition Examination Survey Experience”). These rising values indicate that the general population is becoming more and more comfortable with the idea of donating personal biological samples to be used for genetic research. In fact, assuming that the same pattern has continued since the publication of this survey, it is safe to conclude that the percentage of individuals who would be willing to allow the collection and storage of their biological samples today is even closer to or approaching 100%. Nevertheless, it is important to note that in the 2003-2004 survey, participants were not told that their samples could be used for genetic research. Therefore, the dramatic increase from a 90.1% consent rate in 2001-2002 to a 98.4% consent rate in 2003-2004 cannot be explained by an increase in public acceptance of genetics research (McQuillan, “Consent for Genetic Research in a General Population: An Update on the National Health and Nutrition Examination Survey Experience”). What can be deduced from these results, on the other hand is that even though people are increasingly comfortable, or at least more lenient, with the continuation of this technology, there is still some uneasiness associated with DNA collection. This anxiety is what prevents the majority of individuals from consenting, and should be taken into account if genetics research is to be more widely incorporated into social protocol. Although public opinion of genetics research may be improving, as seen by the results from year to year, certain sociodemographic groups tend to be less comfortable with the idea than others. In the 1999-2000 survey round, non-Hispanic blacks compared to other ethnic groups, non-Hispanic whites, Mexican American, and other, had the lowest consent rates. Additionally, in the 2001-2002 survey round, female participants had significantly lower consent rates than male participants (McQuillan, “Consent for Genetic Research in a General Population: An Update on the National Health and Nutrition Examination Survey Experience”). These two groups, blacks and females, tend to be marginalized by institutions far more frequently than other social groups, and as such may be the reason for their unease. In other words, it is a distinct possibility that due to their increased weariness of racial and gender discrimination, these participants opted not to participate with the genetic testing provided by NHANES in fear of potential genetic discrimination in the future. This issue, fortunately, can be addressed with more stringent laws on genetic discrimination as well as greater education on the relatively safe usage of this information for its many benefits. This way, society can take steps to make sure that the advantages of this technology can be available for all people and not just for those who are more comfortable with giving such personal data to medical authorities. NHANES demonstrates the recent public perspective on genetics research: even though consent rates are generally increasing to a fairly large percentage, there are still some individuals, mainly blacks and females, who are unable to reconcile the benefits of this technology with the risks to their personal and social well-being. With that in mind, it is difficult to distinctively say whether the public is truly for or against genetic testing. However, what can be determined is that as stricter regulations are proposed to protect against genetic information abuse, the more likely it will be that this technology benefits more people than it hurts. This notion should remain the guiding principle for DNA use in the days to come; it is only by showing the public that there is nothing to be afraid of, that society can finally capitalize on how much more can be gained with the use of genetic information. Perhaps by then, the double edged sword can become the instrument of society’s future accomplishments and not a threat upon those who wield it. “Advancing Justice Through DNA Technology: Using DNA to Solve Crimes.” N.p., n.d. Web. 10 Nov. 2014. Alana Massie. “DNA Exonerations Nationwide.” Innocence Project. N.p., n.d. Web. 18 Oct. 2014. Catherine Doss. “College of Science Magazine Explores Genetic Medicine, Cancer Therapies.” VirginiaTech: Virginia Tech News. N.p., n.d. Web. 18 Oct. 2014. “DNA Exoneree Case Profiles.” Innocence Project. N.p., n.d. Web. 18 Oct. 2014. “Gene Therapy and Cell Therapy Defined.” American Society of Gene and Cell Therapy. N.p., 2011. Web. 9 Nov. 2014. “Genetic Information Discrimination.” U.S. Equal Employment Opportunity Commission. N.p., n.d. Web. 18 Oct. 2014. “Genetic Privacy.” N.p., 2 Oct. 2014. Web. 10 Dec. 2014. 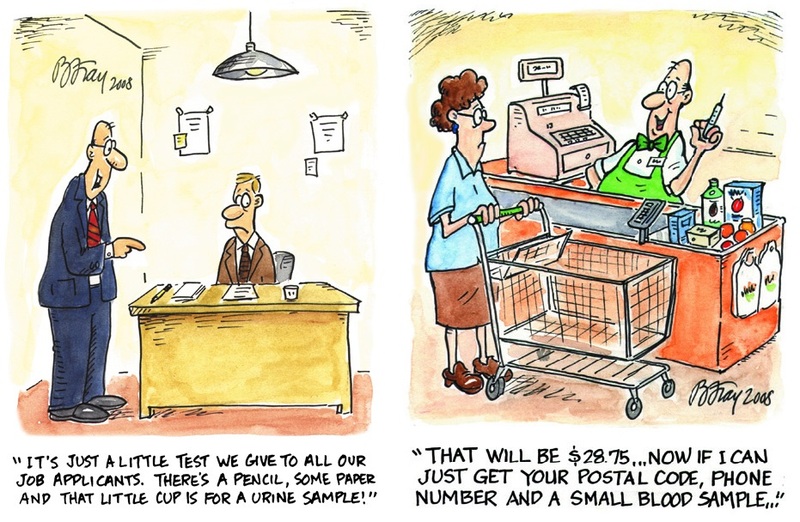 “Genetic Testing.” Medic8. N.p., n.d. Web. 9 Nov. 2014. “GINA: Genetic Information Nondiscrimination Act.” Web. Guillén, Margarita et al. “Ethical-Legal Problems of DNA Databases in Criminal Investigation.” Journal of Medical Ethics 26.4 (2000): 266–271. jme.bmj.com. Web. 9 Nov. 2014. “How Does Gene Therapy Work?” Genetics Home Reference. N.p., 9 Dec. 2014. Web. 10 Dec. 2014. “Is This How We’ll Cure Cancer?” Forbes. N.p., n.d. Web. 20 Oct. 2014. Jill Lawless. “Spread of DNA Databases Sparks Ethical Concerns.” The Big Story. N.p., n.d. Web. 19 Oct. 2014. Kravets, David. “Court OKs Taking DNA From Felony Arrestees.” WIRED. N.p., 23 Feb. 2012. Web. 10 Dec. 2014. “Liberty, Privacy, and DNA Databases.” The New Atlantis. N.p., n.d. Web. 9 Nov. 2014. McQuillan, Geraldine M., Qiyuan Pan, and Kathryn S. Porter. “Consent for Genetic Research in a General Population: An Update on the National Health and Nutrition Examination Survey Experience.” Genetics in Medicine 8.6 (2006): 354–360. http://www.nature.com. Web. 10 Nov. 2014. Saporito, Bill. “The Conspiracy To End Cancer.” Time. healthland.time.com. Web. 20 Oct. 2014. “The Genetic Information Nondiscrimination Act (GINA): A Discussion Guide for Clinicians.” National Coalition for Health Professional Education in Genetics. N.p., 2014. Web. 9 Nov. 2014. “TIME Magazine — U.S. Edition — January 11, 1999 Vol. 153 No. 1.” N.p., n.d. Web. 20 Oct. 2014. “TIME Magazine — U.S. Edition — January 17, 1994 Vol. 143 No. 3.” N.p., n.d. Web. 20 Oct. 2014. “What Is the DNA Database?” webpage. N.p., 19 Apr. 2010. Web. 9 Nov. 2014. Wojcicki, Anne. “Know Your Genome: What We Can All Gain from Personal Genetics.” The Guardian 13 Mar. 2013. The Guardian. Web. 19 Oct. 2014.